The Design Conspiracy Blog: ease up eh? This morning at Conspiracy Towers, the flyer shown above dropped through our door. 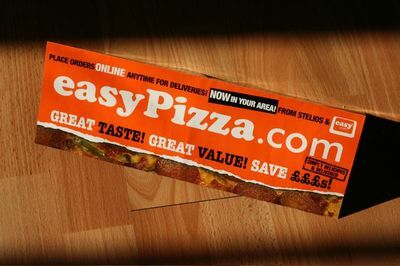 It seems that after jets, cars, internet access and hotels, the next consumer essential to get the whole orange and white Cooper Black treatment is fast food, with the establishment of easypizza.com. Can we just say a big thanks - we're fed up with rip off Double Pepperoni that's well beyond the affordability of the working man, delivery boys that will only accept Gold Bullion and sniffy establishments on the Old Kent Road that look down on our grease-covered overalls. Stelios, you have truly brought Pizza to The Masses. Respect.